It’s never an easy task to take on a subject that’s been worked over many times before, all the more when you’re still a novice filmmaker. Murder mysteries have long been an important part of Korean cinema and although there are many brilliant, powerful titles in the genre (i.e. Mother , Memories of Murder , The Chaser , et. al) it’s getting harder for directors to deliver breathtaking suspense without referring to some well-known plot elements. 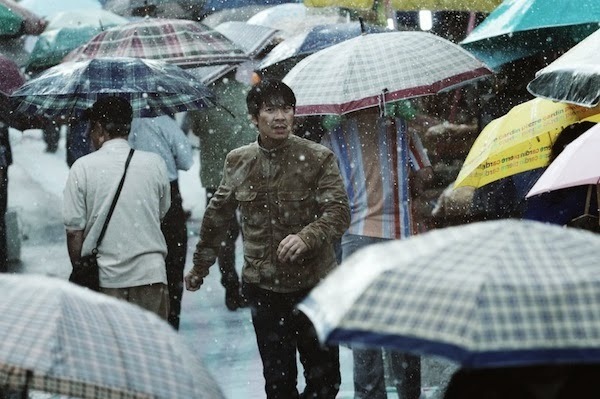 Newcomer Jeong Geun-seop set the bar high for his first feature. Despite that fact that Montage deals with a seemingly familiar premise, it never actually looks to clichés as its source of inspiration. The strongest aspect of the presented storyline is its thorough attention to details when it comes to building up the suspense and sustaining it gradually as the plot thickens. Jeong’s intention is to reveal as little as possible and to keep the action at a rather leisurely pace in order to arrive at a climax that’s as surprising as it is compelling. The film begins with a brisk and chaotic retrospection that vaguely introduces a 15-yeard old kidnapping/murder case that’s about to expire due to the statue of limitations, thus making the prime suspect, who’s still hiding somewhere in the open, untouchable. This horrifying incident left two people completely devastated – Ha-kyeong, the mother of the dead girl (Uhm Jung-hwa) and Cheong-ho, the policeman assigned to the case (Kim Sang-kyung). With only hours until the investigation’s validity runs out their last attempt at catching the mysterious man seems excruciatingly desperate, but a few new traces unexpectedly lead to an encounter with the killer. For them it’s like a light at the end of the tunnel that inevitably fades away during an intense, yet poorly planned chase, which soon culminates with another huge disappointment. Finding himself in a state of utter helplessness, Cheong-ho quits his job, while Ha-kyeong confronts her worst nightmares and chooses to look further for clues all on her own. A few days later a young girl is abducted while spending time outdoors with her grandfather (Song Young-chang) and all signs point to the same kidnapper. Knowing Cheong-ho’s expertise, the perplexed policemen decide to give him a call. Eager to catch the man who ruined his life he blindly accepts an invitation to join yet another intense manhunt, but soon finds himself at odds with former co-workers, who start searching for the truth in all the wrong paces. The investigation goes awry for the first time after a shocking revelation, which quickly makes the grandfather the main suspect. That’s an assumption Cheong-ho simply can’t agree with though, and once again goes solo in pursuit of an unpredictable and sharp-witted criminal, who outsmarts the police in a similarly effortless manner as the kidnapper in Voice of a Murderer (2007). 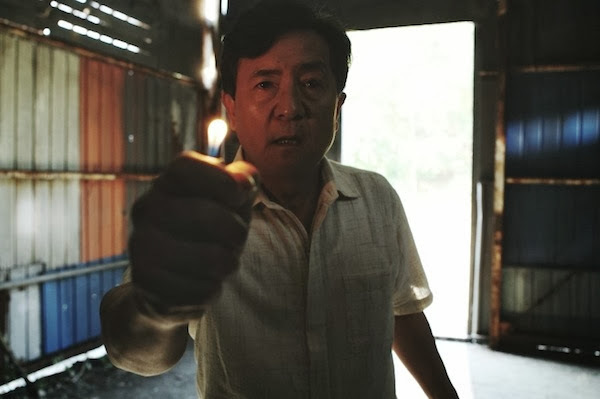 Without going into spoiler territory, I just need to mention that as soon as more clues begin to appear and connect the two crimes with astonishing accuracy, Jeong’s impressive craftsmanship shows its true, innovative face. The plot centers on three characters, each with their own reason to be interested in the recent case. Impressive is the fact that although Jeong concentrates on creating a sharp and steady atmosphere of mystery he never loses sight of the main characters. As they proceed to expose their feelings towards the whole situation they’re consciously destroying the barrier between themselves and the viewers, in the end giving the story a pleasantly realistic touch. The brightest figure of them all is the hard-bitten mother played by Uhm Jung-hwa whose powerhouse performance is reminiscent of Kim Hye-ja’s in the aforementioned Mother. Though it’s unnerving to see the pain that she so emphatically accentuates, it’s also bracing to observe her willingness to act. Cheong-ho senses that this second case might be the only definitive possibility to compensate for past faults. It’s never heartbreaking, albeit visible, that his guilt-ridden determination to find the kidnapper is almost only self-centered. As the storyline progressed I noticed how Kim Sang-kyung in Montage gets into character with much more passion and emotional attachment than in Memories of Murder, making his role penetrating and vividly convincing. Han-cheol, the grandfather, might look like the bleakest character, yet the significance of his contribution to the story shouldn’t be underestimated. Though wrongfully accused of a crime he didn't commit those who do think that he was actually trying to deceive everyone and run away with both the granddaughter and the ransom money did have sufficient evidence to believe in that scenario. my inability to connect the dots before it was too late.